A Small Town In Italy Embraces Migrants And Is Reborn : Parallels The southern Italian village of Riace had an aging, dwindling population. That was before it was reborn as a global village following the arrival of thousands of migrants from more than 20 countries. Riace's medieval old town is a warren of winding cobblestone streets atop a hill. Migrants have revitalized the shopping district. The town of Riace lies near the toe of Italy's boot. Small shops line its winding, cobblestone streets. It's perched on a hilltop, a typical medieval village with a church at its center. But there is nothing typical about Riace's people. Out of a population of 1,800, 450 are former refugees. Their children outnumber native Italians at the local school. 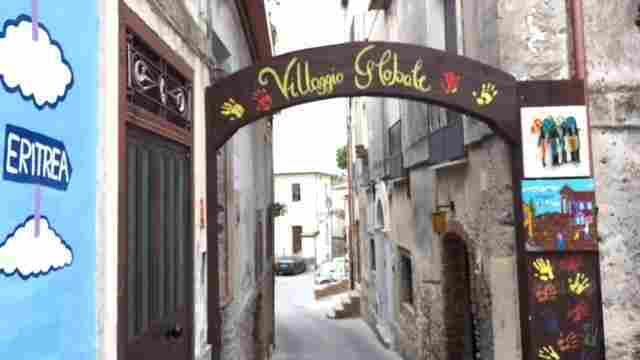 Riace now calls itself a global village, whose residents come from more than 20 countries beyond Europe. 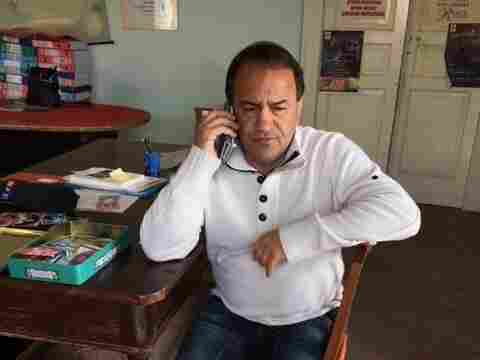 "So many civilizations have left their mark on this land," says Riace's three-term mayor, Domenico Lucano. "The ancient Greeks and Romans, the Arabs, Turks and Saracens. And this has helped us have very few prejudices about other peoples." Lucano says in the past 18 years the town has welcomed more than 6,000 migrants. As they arrived in Riace, an aging place with high unemployment, the mayor sensed an opportunity to revive what was quickly becoming a ghost town. He offered refugees abandoned apartments and job training. 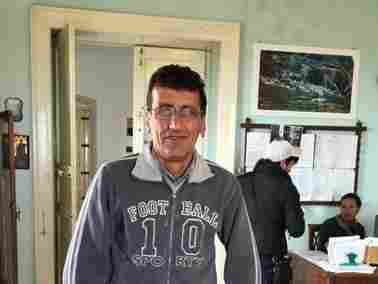 Bahram Akar, 50, arrived one night in the summer of 1998 on a boat carrying him and about 250 other Kurdish refugees. "Next day, in the sunlight," Akar said, "I looked at the landscape and I liked it immediately. It felt like home." The town receives about $40 a day in government subsidies for each refugee for one year. A portion goes to the migrants and the rest pays for their living expenses. Once they've received regular documents, most move on to northern Europe, where more jobs are available. But some, like Akar, remain. Their impact can be seen in the town's shops. 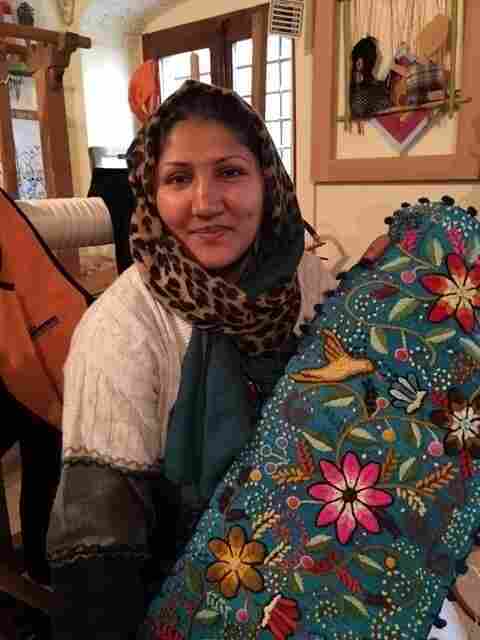 Zara Hosseini, 34, weaves fabric on a loom and then embroiders it with delicate needlework. She and her daughter fled Afghanistan and arrived in Riace three years ago after a harrowing trip across land and sea. She says she feels safe here. "The Taliban are very, very bad for women," she says, speaking Italian. "Terrible, no democracy, women are kept down. I came to Europe so that my daughter could go to school. I don't want her to die in war." Selma Giamah, a young Somali woman, also works in the shop. Despite her halting Italian, she's able to convey the horrors she went through fleeing her country. Her journey took her through Ethiopia, Sudan and Libya, where smugglers kept her captive for eight months. "They made us sleep on the filthy ground," she says. "They kept asking for money. They beat us. No food. No water. Then three men took me outside." Selma's voice drops off but her expression and gestures make very clear what the men did to her. She's been in Riace for two years and has no intention of leaving. In contrast to other parts of Europe, Riace's natives say the migrant experiment has been good for the town. Mirella Cogocoru credits their arrival with enabling her to expand her bakery into a grocery store and to open a cafe next door. "It's good the migrants are here," she says. "The town is now full of people. Before, there was nothing, no work." Mayor Lucano — who is bemused to have appeared on Fortune magazine's list of 50 great world leaders — doesn't claim Riace's choice can work everywhere. But he offers his town's experience as a counter to European politicians who keep migrants out. "To those Europeans who fear migrants bring disease, take away their jobs and sense of security," he says, "they bring us their culture, their world, their colors and their knowledge."